There it is. 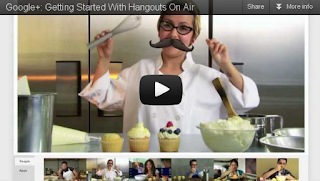 Over the next weeks, more and more users will be able to use Hangouts On Air. Live Streaming and recording to YouTube. A feature many can't waiting for. It could be a new killer feature for vloggers and podcasters. Unfortunately I have no access until now. So I couldn't really try it. For me it's important that it is possible to record a hangout hassle free on YouTube. Without a lot of restrictions. That will be key. A 10 minute conversation is one thing, but to address vloggers and podcasters, there need to be no length limit. I do some podcasts. One normally ranges between 30 and 60 minutes and one between 60 and 90 minutes. I ditched live streams, because it was horrible to broadcast. With Hangouts, I totally see coming back, or at least, having discussions recorded. There is a whole new set of possibilities. You could add community engagement in your netcast. You could easily having a conference with guests from all over the world. Or have a simple way to do a multi-camera setup recording on GNU/Linux. A webcam and 1 or more Android phone(s). You can click which one will be shown easily. Talking about Android phones. From Gingerbread upwards, you can enter in Hangouts via the Google+ app and participating quick and easy from almost anywhere. I'm thrilled to stream from a live geocaching trip out of the forest :) Honestly, you could let people chime into your podcast and having something like outdoor reporters. You see, there is a wide range of possibilities. If, and only if, Google sets the limits very high. For everyone and not only for a few "approved" celebs. I have no problem with the TOS from Google, stating that the user who started the Hangout is fully responsible for all the content shown in the recorded video. This is mandatory and should be clear anyway.